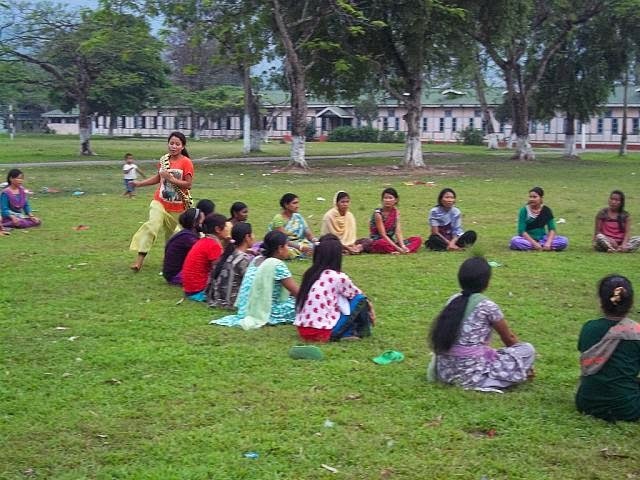 72 participants from Tirap, Changlang, Lohit and East Kameng districts of Arunachal Pradesh attended the Camp. Experienced teachers shared their valuable knowledge with the participants. Activities were conducted with locally available materials like dry leaves, flowers etc. Action Songs, Patriotic Songs, Stories, Various Games were taught during the camp. It is to be mentioned that Vivekananda Kendra is running 115 Balwadis in Arunachal Pradesh including the remote circles like Lazu, Wakka, Khimiyong etc. The Balwadis are not regular formal schools, but to prepare the tiny tots through Games, Stories and Songs for formal schooling. It is a system to teach through play way method. The camp concluded on 6rd May 2014. Er.N.Ngemu, the Vibhag Pramukh of Vivekananda Kendra, Tirap Vibhag graced the occasion. He encouraged the participants to work with a service like attitude to uplift the society and play their respective role effectively.